1. They are on sale/offer i.e. 50%, 3 for 2 etc. WHSmith gives superb discount but not many people are aware of their vouchers (I used to be one of those). The books can be random and most of the time, I got lucky i.e. good storyline/content. However, there are books which fall under ‘why on earth did I choose this’ and ended up on the shelf, unfinished. 2. The TV/movie adaptation is awesome or received great reviews e.g. Games of Thrones, TVD, Twilight, Percy Jackson etc. 3. Under #1 category and they happen to be great, I will definitely get the whole series (Blue Bloods). I am unsure how I got into the Potter fever but all I could remember that I was pregnant when I read the first book and fell in love instantly. Anyway, this entry is triggered by my recent steal which fell under #1, however I think the fact that it was mentioned on Ellen show that made me intrigued. Not knowing what it was i.e. reading the reviews or synopsis, I simply picked up the book upon seeing the huge discount that went with it. Oh what the heck. I got the book, hence might as well read it. I am only on chapter three and already falling hard for Christian Grey; “attractive and deeply intimidating”. He’s looking down at me, his gaze hooded, his eyes darkening. 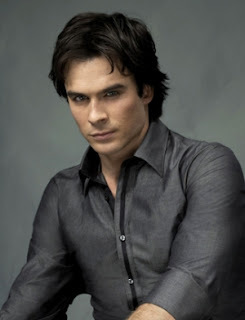 Step aside Damon Salvatore for there is a new man in town. I saw the video Ellen did the book reading. Hilarious. From the reviews this book feels like something that I don't want to get caught reading though LOL, but boy the books sweep the first three spots on NYT. thanks to your recommendation, I downloaded the books via mobile9 (cheapskate me! ), now squinting to read it... I'm at the part where he brought her to Seattle via helicopter.......hehehheheh..